O.K....O.K.... I know, it's HOT. The August heat in Florida is biblical, giving testament to the old adage: "It's so hot you can fry an egg on the sidewalk." I can personally attest to the hotness of the sidewalk because my foot pads are blistered. But, that's no excuse not to garden in Florida in August. If I can manage to pee on each and every fence post of these 10 acres each and every a.m. and p.m., then you can get out there and weed, fertilize, prune and replant. Just remember to keep hydrated. Right now, though, if you don't have seeds on hand, you won't find any in garden centers. Florida law requires that all seeds be removed from shelves at garden centers by July 31 (only bulk suppliers still have seeds). But, guess what? They will restock shelves after- you guessed it - August 15. Just in time for your fall flower seed planting. So, you have plenty of time until then (and you should pace yourself, what with the heat and all), to get those flower beds prepared. TIP: If you have a flower bed that is heavily infested with nematodes, plant it entirely with French Marigolds. This annual flower is known to decrease nematode populations. Do it this month ahead of the cool-season planting. Next..... More Florida August gardening things to do. I'm so glad I'm just writing about it. Remember, avoid overheating, keep hydrated, work in early morning and evenings - oh, and watch out for the lightening bolts. As you're sweating, panting and ducking, just keep remembering how nice it's going to be December-February while the rest of the country is in a deep freeze and snow bound. A little August heat is a small price for living in paradise. 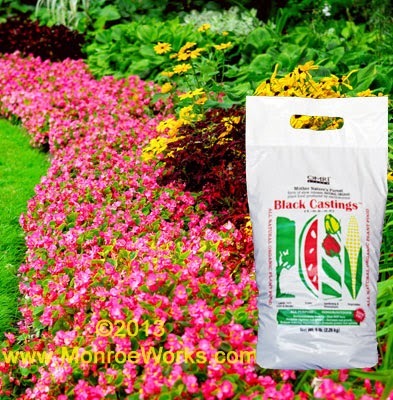 Recharge your flower beds with Pure Black Castings. This certified organic worm-based fertilizer will not only provide slow-release nutrition for your flowers, it also has water retention qualities. And, no leaching or run-off.